What the rep said: C3 is camber dominant, banana submissive. The board is based on an overall camber shape with a small amount of rocker at the waist. Stats/Setup: I checked in at 6'1" and 165 pounds when I rode the Jamie Lynn 157 Mid-Wide with Salomon Dialogue Boots (size 9.5) and Union Force SL bindings at Mt. Hood Meadows, Oregon. First impression: Of course, Jamie's signature graphics. The base is as curvy as the sidecut. I wonder when Lib is going to make a board with C4. That would really pop... Average weight. Move on over to lib-tech.com for more specs and Jamie Lynn videos. The Ride: The first thing I always do when I demo a board is get up to speed and rail some mid-radius turns. This board handled those turns well enough to put a smile on my face that didn't leave until I gave the board back. Magne-traction is the real deal, people. With less banana than C2, this Phoenix was really ripping. 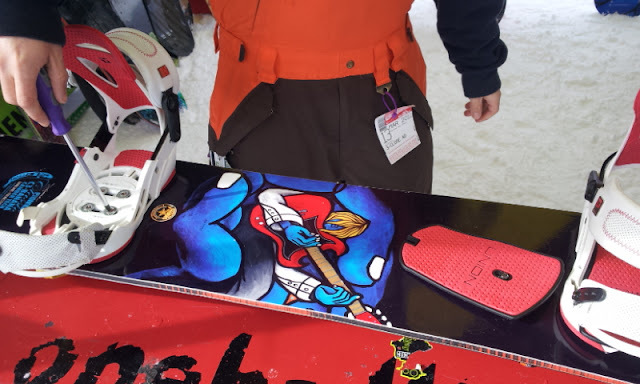 While we're on the subject of ripping turns, this board got edge to edge pretty well for a mid-wide, though my feet would have preferred the narrower 160. It was at home in the trees, too, but its real element was laying down deep trenches with big, fast turns. Going from C2 to C3 also rewards you with a welcome increase in pop and stability. This board had some spring that's been missing from Lib boards since the banana takeover. It's also less likely to rotate through turns and more apt to link them up with power. It handled speed and landings like a boss with that trademark Lib Tech dampness. You're not going to butter this board around like a full banana, but it's not plywood-stiff, either. It has a nice, all-mountain, medium-stiff flex. It won't do your nosepresses for you, but it will give you what you put into it. As with most demo days, I didn't ride any rails or substantial pow. I think this would be a capable board in either of those avenues. It has a relatively short contact length for its overall length, giving it plenty of nose to float. It's also set a half-inch back on a twin shape. Move the bindings back more for pow and closer to the center for optimal switch riding. If you want to ride switch in the pow, well, get a bigger board. Bottom Line: More camber means a more snowboardy, less skateboardy feel than past Lib offerings. The pop is back. The flex is right. For me, this is where it's at. This is my favorite Lib Tech board since a pre-banana TRS MTX. And I'm not the only one who likes it. Snowboard Magazine made it a Platinum Pick this year. It definitely lets you charge the whole mountain. Can you cover the bill?